The book that reveals how ballet happens . . .
Later chapters . . . In a scuffed-up studio, a veteran dancer transmits the magic of an eighty-year-old ballet to a performer barely past drinking age. In a converted barn, an indomitable teacher creates ballerinas as she has for more than half a century. In a monastic mirrored room, dancers from as near as New Jersey and as far as Mongolia learn works as old as the nineteenth century and as new as this morning. A bestselling, prize-winning author steps into this world as a total outsider, spends a year in rehearsals, classes, meetings, auditions, and performances, and comes away with a tour de force. This thrilling panoramic exploration of the unique realm he dubs the Land of Ballet reveals the work behind the art in all its dailiness and frustration, generosity and triumph—and considerable drama. Where Snowflakes Dance and Swear zooms in on an intimate view of one full season in the life of one of America’s top ballet companies and schools: Seattle’s Pacific Northwest Ballet. But it also tracks the Land of Ballet to venues as celebrated as New York and Monte Carlo and as seemingly ordinary as Bellingham, Washington and small-town Pennsylvania. Never before has a book taken readers backstage for such a wide-ranging view of the ballet world from the wildly diverse perspectives of dancers, choreographers, stagers, teachers, conductors, musicians, rehearsal pianists, l ighting directors, costumers, stage managers, scenic artists, marketers, fundraisers, students, and even pointe shoe fitters—often in their own remarkably candid words. Where Snowflakes Dance and Swear shows how ballet is made, how it is funded, and how it is sold. It escorts you front and center to the kick zone of studio rehearsals. It takes you to the costume shop where elegant tutus and gowns are created from scratch. It brings you backstage to see sets and lighting come alive while stagehands get lovingly snarky and obscene on their headsets. It sits you down in meetings where budgets get slashed and dreams get funded—and axed. It shows you the inner workings of Nutcracker, from kids’ charming auditions to no-nonsense marketing meetings, from snow bags in the flies to dancing snowflakes who curse salty flurries that land on their tongues. It follows the tempestuous assembly of a version of Romeo and Juliet that runs afoul of so much pressure, disease, injury, and blood that the dancers begin to call it cursed. This book uncovers the astounding way ballets, with no common form of written preservation, are handed down from generation to generation through the prodigious memories of brilliant athletes who also happen to be artists. You discover how Balanchine stager Francia Russell teaches the complex patterns she learned at the master’s side and still knows by heart. You watch Susan Stroman create a new ballet from the ground up and see dancers reconstruct a David Parsons work in strobe light and a William Forsythe piece co-starring twenty aluminum tables. You’re there when Peter Boal, with the generosity of ballet’s unwritten rules, touchingly transmits the essence of Balanchine’s Prodigal Son from his mentors Jerome Robbins and Edward Villella (who both learned it from Mr. B) to a promising young dancer. Where Snowflakes Dance and Swear puts readers up close to watch art get created and polished on union time. It goes on tour with the company to Vail, Colorado, where dancers contend with altitude that makes their muscles cramp and their lungs ache. It visits cattle-call auditions and rigorous classes, tells the stories of dancers whose parents sacrificed for them and dancers whose parents refused to. It meets the resolute woman who created a dance school more than fifty years ago in a Carlisle, Pennsylvania barn and grew it into one of America’s most reliable ballerina factories. It shows ballet’s appeal to kids from low-income neighborhoods and board members who live in mansions. Shattering longstanding die-for-your-art clichés, this book uncovers the real drama in the daily lives of fiercely dedicated union members in slippers and pointe shoes—and the musicians, stagehands, costumers, donors and administrators who support them. 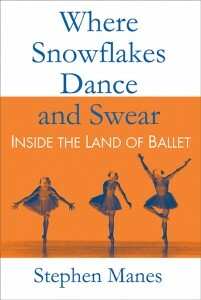 Where Snowflakes Dance and Swear: Inside the Land of Ballet brings readers the exciting truth of how ballet actually happens.